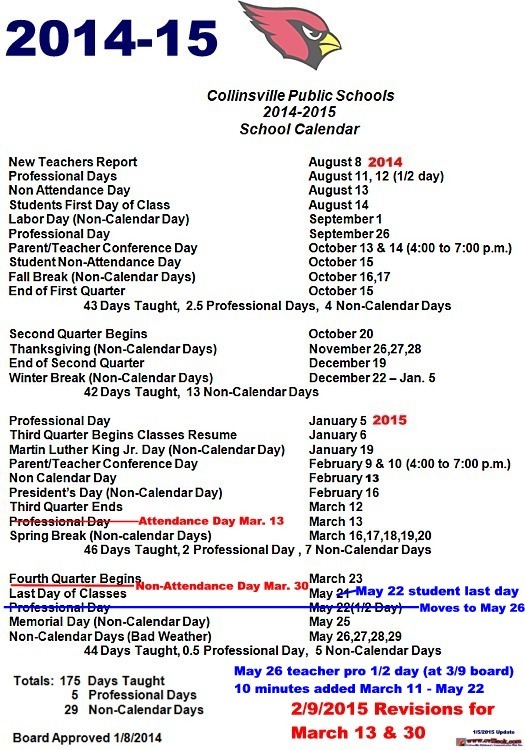 Link To Agendas on School Web Site. 1) Call to Order and Roll Call of Members. 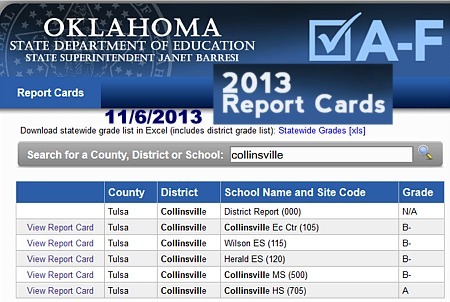 8) Presentation of the A-F Report Card for the Collinsville School District. Cara Jones -- Each Principal described the efforts at their campus to improve student performance (which hopefully also improves A-F state measures for the schools). Each has remediation efforts in addition to the normal instruction to target students with the most need in reading and math. Arlin stacy had an entertaining video spoof of some "alternative" approaches at his campus before the real approaches were presented by Jenifer Salley. The high school received an "A" and the other campuses received "B-" in the controversial state scores released in November 2013. 10) Proposed Executive Session to Discuss Personnel and Hiring of Certified and Classified Personnel, Pursuant to Section 307 (B) (1) of the Open Meeting Law, O§, so that the Board May Return to Open Session And Vote to Hire or Not Hire Certified and Classified Personnel for FY2014. 11) Vote to Convene in Executive Session. 12) Vote to Acknowledge Return of Board to Open Session. 13) Executive Session Minutes Compliance Announcement. 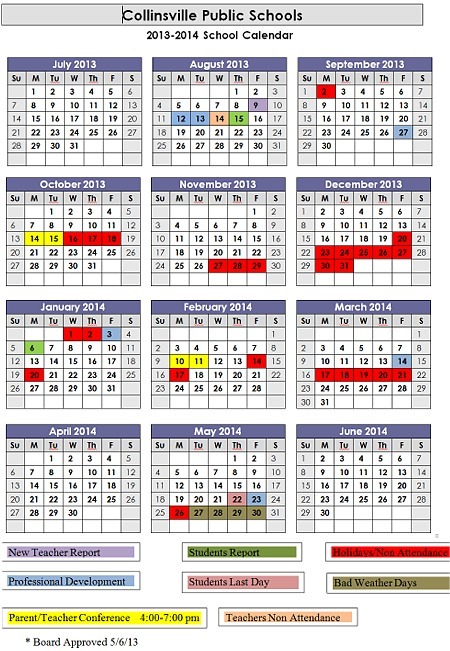 15) Discussion and Vote to Approve Collinsville Public Schools Voluntary Separation Program for 2014-2015 School Year. -- Approved, The current 3 year program of $400 per month to early retirees expires this July. The new 3 year program would begin August 1, 2014 but new participants must be committed before May 1st. The first program saved the district several hundred thousands. It is estimeted 10 to 15 additional early retirees would sign up this time. 16) Discussion and Review of Property Liability Insurance and Vote to Accept Recommendation of Aaron Reinhardt, AAI, Wilcox & McGrath Insurance, Agent of Record. -- Approved (OSMRT), OSIG was only other choice. 17) Recognition of School Board Members during National School Board Member Month. -- see press release. * The chilling tower at the middle school had a small leak that has now been repaired but replacing the gylocol was a lengthy exrecise during the freezing weather and Travis Darland was thanked for his efforts. * Federal Programs ... including Indian Ed resources which are now being more actively used in the remediation efforts described above in item 8 (A-F Report Cards). * Upcoming construction (new elementary first): bid notification documents submitted to Tulsa World. Jan. 23rd contractors info meet before bids. Feb. 6th bids will be opened. Likely special board meet Feb. 19th to act on bids received. Final drawings for the high school improvements expected by the end of January and that bid process can begin. * Terry commended the principals (& their great staffs) for all their A-F efforts. They have great teachers that received "B" grades for "A" efforts. 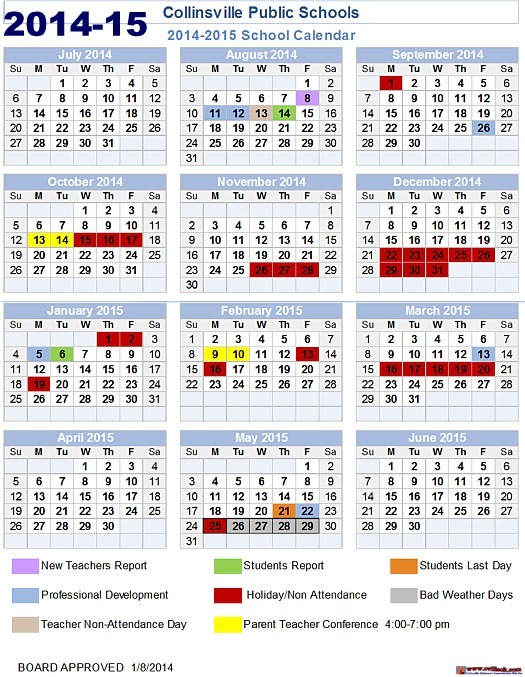 * 5 "snow days" used leaving just 2 built into the existing schedule (see schedule to right with May 22 as last day of classes). * Recent state funding info indicates local loss of $191K ... "but we will make ends meet". Most other surrounding districts have even largers losses. * Congratulations and thanks to the school members for their efforts (year rouind) not just the January school board recognition month. * Athletic Director Jim Riley took the opportunity to brag on the CHS athletic programs continued success ... calling it the "best deal in town". Jim also commented positively on the selection of the sports program success as one of 2013 top stories by this web site. 21) New Business: (if any, of an emergency nature or that was not known at the time the agenda was posted). * The board accepted the (same day) resignation of April Richardson (para). The board then approved the (timely same day) hiring of Alisa Ruth to replace her as para-professional. She is a Special Education major and daughter of a Herald teacher. This notice being given and displayed by the authority of the School Board of Independent District, I-6, acting by and through the undersigned. 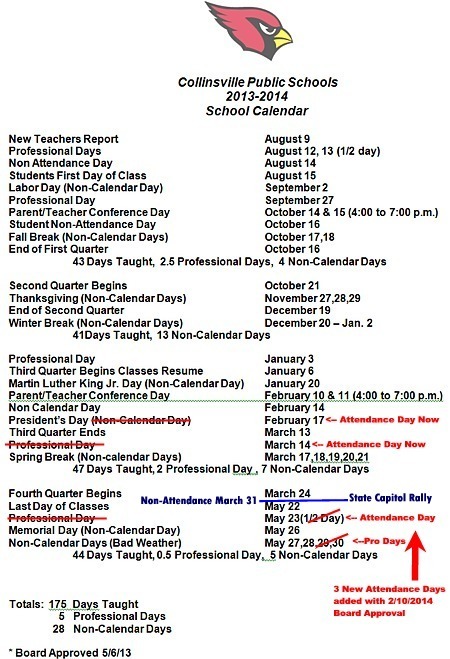 Posted this 6th day of January 2014 at 12:00 p.m. on the door of the Education Service Center at 1902 West Maple, Collinsville, OK 74021.